1:08 – Ruth’s morning ritual to ensure she is prepared for teaching her Flywheel class. 3:08 – How taking dance as a child set her up for her future career as a cycling teacher and studio owner. 6:06 – Ruth’s shares the challenges she had early in her adolescence. 8:10 – The intense response her mother had when she found out Ruth got an additional piercing in her ear. 9:40 – The special relationship she had with her father and their trips to Nom Wah Tea Parlor at 13 Doyers Street in Chinatown in New York City together. 20:40 – How her job in a chocolate shop in Rockefeller Center taught her the importance of customer experience. 24:50 – How she met her husband and what her mindset was at that time in her life. 29:40 – Why Ruth was second-guessing her marriage and why she felt stuck. 36:10 – Ruth’s Mom’s reaction when she told her she was having twins. 37:48 – How therapy helped her realize she was in an unhealthy marriage. 39:51 – She explains why you have to be a strong person to go to therapy. 42:49 – How to find the right therapist and how long to stay with them. 47:17 – How Ruth told her children that she and her husband were getting divorced. 49:42 – Her first try at spinning . . . who knew this would lead to her future as a teacher and entrepreneur! 54:10 – She started to shift the way the traditional classes were being taught – through music and words from the instructors. 57:52 – How her first spin studio concept, SoulCycle, came about. 1:02:03 – What she learned from the startup and what she would do differently. 1:03:46 – Her philosophy on ensuring that the studios were and are customer centric. 1:07:24 – The moment they knew that SoulCycle was taking off. 1:09:23 – What it was like going from an owner at SoulCycle to an employee and what kept her going. 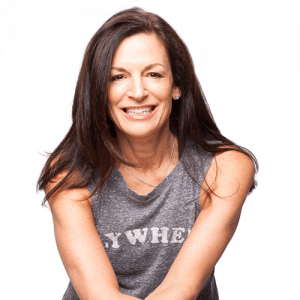 1:10:10 – How she was able to leave and start a new spin concept, FlyWheel. 1:15:00 – Since starting up in 2010, they have grown to 42 studios. 1:20:15 – Big changes that took place when FlyWheel took on another partner and how she had to look at her strengths and role at the company. 1:23:16 – Her favorite inspirational song by Annie Lennox and Whitney Houston, Step by Step. 1:28:48 – Ruth shares what it’s like to have celebrities in her class and what it was like when she played a song from Sting’s daughter while he was taking her class. 1:30:32 – What it was like to be invited to the White House and meet President Obama. Ruth Zukerman is the co-founder of Soul Cycle and Flywheel, both wildly successful companies that innovated the studio cycling movement. Ruth pioneered the boutique fitness industry by creating the “studio” with a pay per class structure, modeling them after the dance studios she would frequent when she was pursuing her dance career. Over the last decade with these companies, she has come to realize that her passion is greater than simply cycling or fitness. Her mission is to connect people to each other as well as to their own inner strength and empower them to carry the positive, powerful attitude they have on the bike on into their lives and their careers. She speaks around the country, inspiring people to get unstuck and find new paths and new passion for a successful second, third or even fourth act in their careers. Ruth is currently the Creative Director at Flywheel and still passionately teaches classes there every week. She lives in New York and is very close with her grown daughters. Her memoir RIDING HIGH: How I Kissed SoulCycle Goodbye, CoFounded Flywheel and Built the Life I Always Wanted, was published in October 2018.